Nothing says Italian more than a rich Tiramisu! It is my addiction. My family knows that I prefer Tiramisu to any other food in the world. 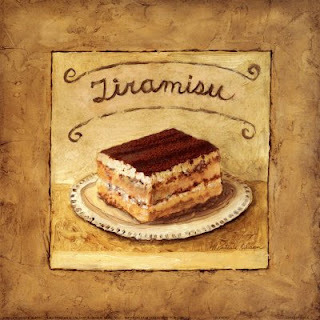 And it took me years to create the best Tiramisu recipe, one I've kept secret for many years. And now I'll share it with you! Combine the espresso and sambuca/anisette and set aside. In a medium bowl, beat the egg yolks and 3 tablespoons of the sugar together until smooth. Set over a hot water bath and beat for 3 minutes until light and foamy. Remove from the heat and beat this immediately into mascarpone mixture. Set aside. Whip the cream until the cream holds a firm shape. In two small additions, fold 1/3 of the mascarpone mixture into the whipped cream. Then fold the whipped cream into the remaining mascarpone mixture. Set asside. Beat the egg whites and salt on medium until foamy. Increase the speed and add the remaining 3 tablespoons of sugar. Beat until glossy and not dry. Fold the egg whites, all at once, into the mascarpone. Dip each lady finger quickly but entirely in the espresso mixture. Line up in a single layer in an 11 x 13 pan. Top with half of the mascarpone mixture, spreading it out evenly. Sprinkle generously with cocoa powder and powdered sugar. Top with another layer of dipped lady fingers. Top with the remaining mascarpone mixture, spreading evenly. Sprinkle generously with the cocoa powder and powdered sugar. Refrigerate uncovered for 2 hours.